Match Rybka vs. GM Vadim Milov (Elo 2705) at different odds - final score 4,5-3,5 for Milov! 2008-08-09 Rybka wins against IM Eugene Meyer in a match at f7 pawn and 2 moves odds 3,5-0,5 (games). 2008-07-28 Rybka wins against GM Dzindzichashvili in the rematch at f7 pawn odds 2,5-1,5 (click here for the games). 2008-07-06 Rybka wins against FM John Meyer in a match at 3 moves + pawn odds 3-1. 2008-06-08 FM John Meyer crushes Rybka in a match at knight odds 4-0. 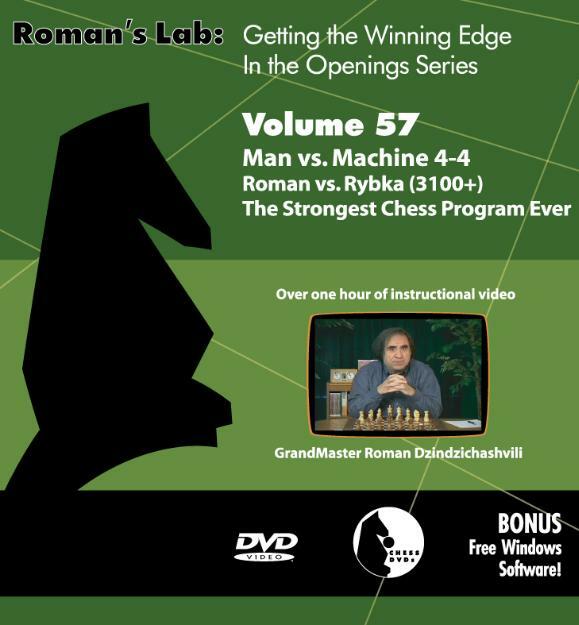 DVD by GM Dzindzichashvili about Rybka - video preview here. You can purchase the full video as download here. Final result: 6-2 for Rybka! Congratulations to the Zappa team!